« Who do you bind to, my lovely? This entry was posted on 19 March, 2008 at 07:46 and is filed under Evolution, Viruses. You can follow any responses to this entry through the RSS 2.0 feed. You can leave a response, or trackback from your own site. 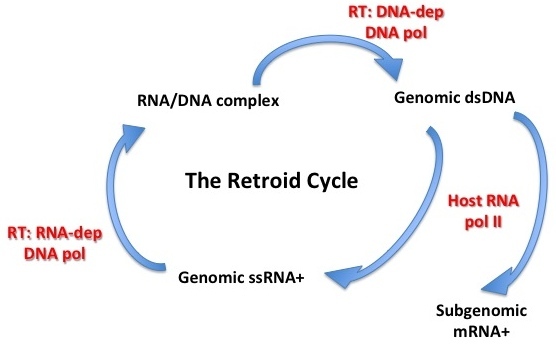 are there any study which postulates the exact era of appearance and evolution of viruses? are there any paleantological evidence of HIV? Why do virus originate before eukaryotes and prokaryotes? Are there any reasons or theories for this? Hi Joleen: well, there is no evidence that they did…but almost certainly viruses were there when the first cells were getting going, meaning before eukaryotes – and they may even have helped give rise to eukaryotes, if you believe the “captured virus” scenario for the origin of the nucleus. Well, there is some indirect evidence. 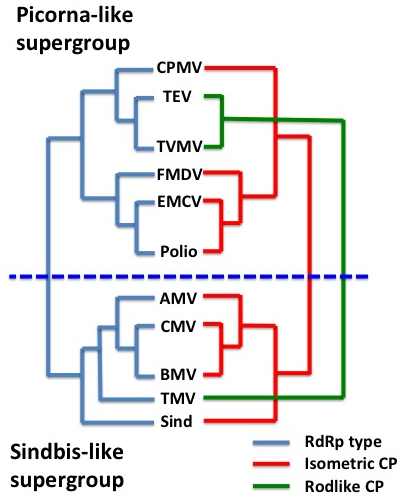 There are structural similarities between the capsids of adenovirus (that infect mammals and birds), and some bacteriophage that infect eubacteria (plain ordinary bacteria if you like) and others that infect archaea (a totally different class of bacteria). 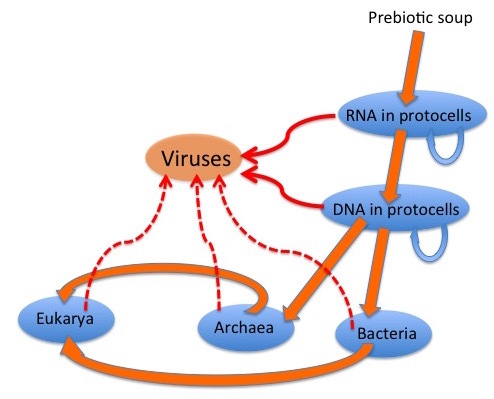 One way to explain this observation is to propose that the ancestor of these three different viruses was around before the eubacteria/archaebacterai/eukaryote split. Some similar parallels can be found between herpesviruses, that infect a wide range of vertebrate and invertebrate hosts, and the tailed phages (like T4, or lambda) that infect bacteria. With these examples, it’s difficult to be sure whether the similarities are due to common ancestry, or to gene transfer between viruses infecting different hosts. However, since these similarites are only visible in 3-d structures, not in sequences, they are probably extremely ancient. Hi Ed: Thank you for the reply. I have a better understanding of the virus now. Thank you. 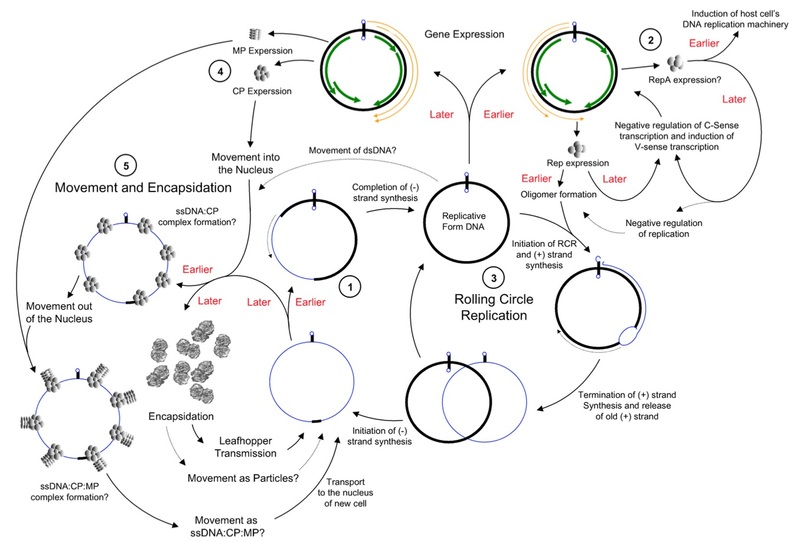 Just when you thought that Mimivirus had enough genes, we find 75 more! Incroyable…! Thanks; I am sure there is an enormous amount to learn from these monster viruses. Great blog, thanks for all of the fascinating posts. However, the link is broken! I can easily find my way back to http://www.microbiologybytes.com but am having trouble locating your source for this information. Could you please help me find locate it, or point me in the right direction to find it elsewhere. Well, that did not take as long as expected! Chad: thank you! Link fixed and I tidied up the font mish-mash too. Why Pavlov smiled in 2008? Pavlov demonstrated effecting placebo phenomena in multi celled organisms by manipulation of their drives-reactions. Now placebo and imagination phenomena are demonstrated also in Earth’s smallest, base organisms, in the genes and genomes of multi-celled organisms, in our primal 1st stratum and 2nd stratum base organisms. A very good reason to smile. Now an interesting chain is exposed to our view, the Genes-Virtual Reality Chain, a most intriguing cultural evolution chain extending from the genesis of our genes to nowadays, throughout life, a virtual reality existence, and by virtual reality phenomena, exploitations and manipulations. Radiation can damage many cellular targets, and the result is that ” molecular parasites ” or viruses. 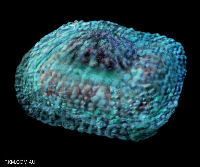 This may have been, once or twice upon a time, the origin of one or more viruses – but is hardly a regular thing! I have a kind of unrelated question, so we are not sure from what viruses evolved, but do we know to what organisms did viruses evolve? did they evolve into bacterias? •	Higgs Particle? Dark Energy/Matter? Epigenetics? All YOK! •	Earth-life is just another, self-replicating, mass format. •	All mass formats follow natural selection, i.e. intake of energy or their energy taken in by other mass formats. •	Evolution Is The Quantum Mechanics Of Natural Selection. •	Quantum mechanics are mechanisms, possible or probable or actual mechanisms of natural selection. •	Life’s Evolution is the quantum mechanics of biology. •	Every evolution, of all disciplines, is the quantum mechanics of the discipline’s natural selection. Reblogged this on Outline Science.